A Year of Being Here: Hafiz: "What Happens"
"What Happens" by Hafiz. Text as published in I Heard God Laughing: Renderings of Hafiz (Sufism Reoriented, 1996). Purported to be translated from the original Persian (Farsi) by Daniel Ladinsky. Please note that Ladinsky's "translations" are controversial, considered by many to be less Hafiz than Ladinsky himself. 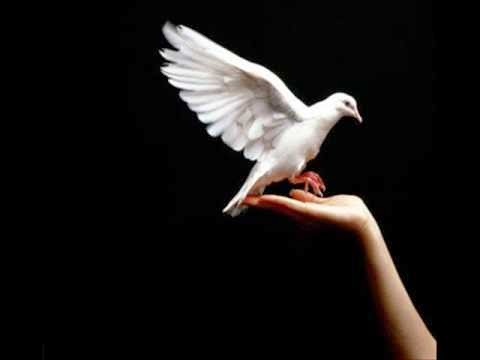 Art credit: "White Dove landing on hand," image by unknown photographer with Getty Images. Wendell Berry: "The Peace of Wild Things"
Hannah Stephenson: "The Box Is the Toy"
Juditha Dowd: "Conversing with an Orange"
W. S. Merwin: "Parts of a Tune"
David Tucker: "The Day Off"
Cornelius Eady: "A Small Moment"
Edward Hujsak: "Sorting Things Out"
Dana Yost: "A New Approach"
Larry Smith: "In Early Spring"
Meister Eckhart: "When I Was the Forest"